8 x 8 x 35 ft. 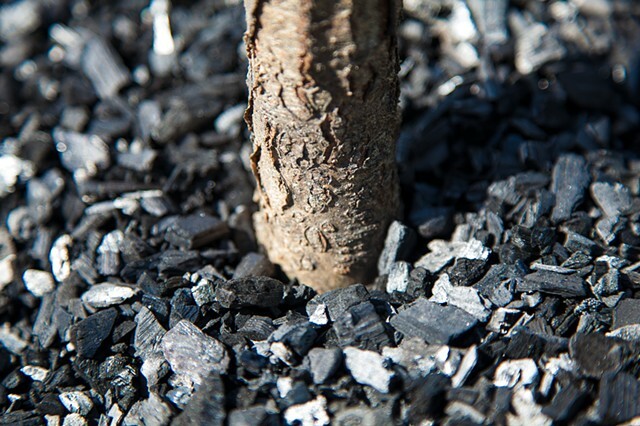 Detail of oak trunk in biochar, a high-carbon form of charcoal created from 'waste' wood and organic material, which can be used to sequester carbon for thousands of years. It is also a helpful soil amendment which increases water retention and boosts mycorrhizal communities. Biochar was first used by Amazonian peoples centuries ago to improve their otherwise relatively poor soil for farming, creating a super rich soil known as terra preta.